In this section of the website you will find useful resources, forms and information that you will need to keep the most important volunteers in the organisation fit and well, the RDA horses and ponies. Please scroll down for up to date equine information. Forms and policies can be found on the right hand side resources section. If you can’t find what you are looking for please contact Emma at the RDA National Office. With thanks to wonderfully generous equine pharmaceutical companies, RDA is able to offer our member groups the opportunity to vaccinate their RDA horses/ponies, free of charge. 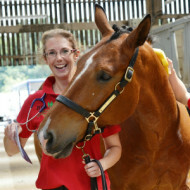 In light of the recent Equine Flu outbreak we have been guided by the BEF and our Honorary RDA Vet, Nathalie Cole, to give groups advice on looking after their equines health. Please follow the link to the BEF page for information on horse movement after Brexit. To access the weight calculator, please click here Please note this will appear as a Microsoft Excel download. The minimum age for a horse to be used in RDA is 5 years old. There is no maximum age however, consideration on the horses fitness, condition and age should be taken into consideration when assessing and reassessing the maximum carrying weight of each pony. Every RDA Group has different equine needs, from sedate ponies to weight carrying cobs to athletic competition horses. We are trying to move away from the stereotypical ‘ideal RDA horse or pony’ and help people to realise that whilst groups needs differ depending on their participants, all RDA horses and ponies need to be fit, healthy, sound, athletic and able to adapt to the lifestyle at an RDA group. Lambrusco is a great example of an RDA horse. An athletic all rounder who is good for those who are looking for a therapy walk session & also fantastic for those who are looking for a full dressage lesson. I am currently compiling a database of horses, ponies, carriages and equipment available and wanted in RDA. If you would like to add to this list please email Emma Bayliss with as much information as possible about what you have available or what your requirements are.